Okay, first, the obvious: the DDJ-400 is a US$249 (279 €) controller with audio interface. And the massive “Rekordbox” logo applied to the side of it means it works with Pioneer’s preferred DJ software. For beginners, the idea is, you plug this thing in and the controller and software teach you basic DJ chops – playing techniques and how the technology works – via an included on-screen tutorial. Gradually, Pioneer have done what was obvious to most of us for them to do – they’ve made that controller work as much like their expensive club DJ players do as they can. A CDJ-2000NEXUS2 will set you back US$2199 each, so out of range of even most moderately successful DJs. This duplicates the rough layout of the wheels, the play/pause and cue buttons, Beat FX, and looping controls of the full-sized CDJ. Now, why I need to get this in to test is, the key variable is the feel of the wheels. What a lot of DJs presumably would be practicing, at least in part, is beat-matching – the security to turn off that dreaded sync button. I don’t want to get too far into that, other than to say, whatever the musical utility of your ability to do that or whether it makes you a “real” DJ, it does have the potential to make DJing “really” less boring for the human operator. My hope is that Pioneer has taken the improved low latency performance of the latest revision of their high-end controllers and brought it to this model, too – but we’ll see. Low latency and low jitter will make this more fun to play. But either way, as a prep tool, this looks like a good investment. The latest Rekordbox is included free, which already amounts to half the purchase price here. (That license is 139 €). If you’re organizing your catalog in Rekordbox to drop on a USB stick, you might as well have a play and mix a bit, too. But that’s not why I think the DDJ-400 is interesting. No, this is the interesting part. 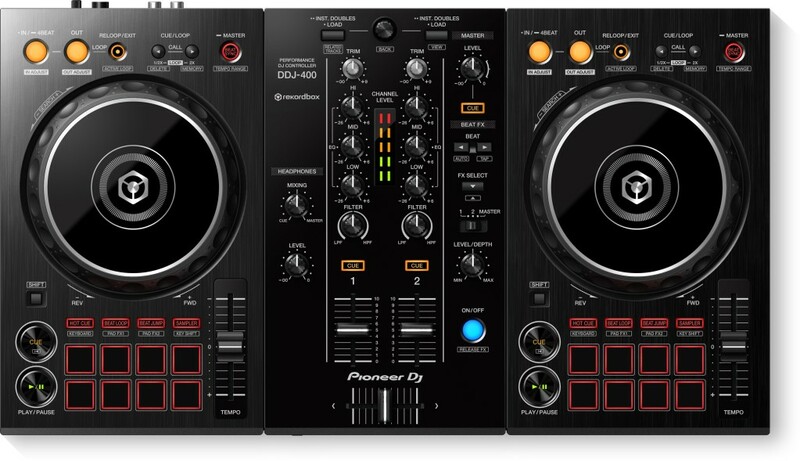 Pioneer says the DDJ-400 is driverless and class-compliant. That means you have an audio interface, with cuing, and a MIDI control surface, that work with any device. So… let’s say you’re a fan of the iOS app Soda. That’s the app that I claimed in December might make you take DJing seriously again. Soda didn’t catch on, but … it also didn’t have a good controller and audio interface to go with it. The DDJ-400 plus Soda are actually more flexible as musical tools than what you get with a $5000 DJ hardware setup… but the total purchase price here, with some recent iPad revisions, is more like $500. And it’s more portable. Or, let’s say you’re sick of controllers and laptops in the DJ booth – as you should be. Now you can add a Linux DJ tool, throw it on a small computer (like a Raspberry Pi), and DIY fashion your own case. That should be priceless for the reaction of people in a DJ booth alone. I wish Roland had done this with their recent DJ controller line, but … now Pioneer have, so we’re sorted. I’m not endorsing it yet, as I haven’t tried the hardware yet or seen how MIDI mapping works, but suffice to say – I’m interested. And even if the above is really the use case, this one is … fun. I wonder that, too. Constantly. In the meantime, if anyone will turn a controller into some wild all-in-one DIY solution, and even come up with novel, out-of-the-mainstream ways of DJing in the process, it’s readers here.